Gamma cameras are traditionally large devices that are situated in nuclear medicine departments, but recent advances in detector design has enabled the production of compact gamma cameras that allow nuclear imaging at the patient bedside and in the operating theatre. 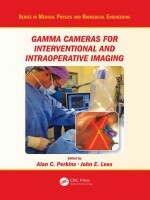 Gamma Cameras for Interventional and Intraoperative Imaging is the first book to cover this new area of imaging, and provides a unique insight into the experimental and clinical use of small field of view gamma cameras in hospitals. This book explores advances in the design and operation of compact gamma cameras and conducts a thorough review of current SFOV systems, before exploring the clinical applications of the technology. It is an essential reference for surgeons, operating theatre staff, clinical scientists (medical physicists), technologists, nuclear physicians and radiologists whose patients could benefit from this technology.